That’s right, you heard me: squee. But let’s face it, at some point, in some way, we’ve all gone “Squee!” at least once in our lives. But if you haven’t, if you’ve never had a Moment of Squee, well then, you’re probably just not as passionate about life as some of us. Sorry about that. Release your inner fangirl and live a little, why dontcha? But if you have gone squee, and if you’re like me, then those moments of squee involve a) getting new and exciting books, or b) meeting favorite authors. So today let’s talk about Moment of Squee Option B. First off, let me address the issue that I happen to be an author. I have had people squee at meeting me, and yes, it’s flattering. Very flattering. So don’t ever be nervous when you meet an author, we don’t think you’re being an idiot. We are more likely just as thrilled to meet someone so excited about us and our books. I’ve had a number of people apologize for being excited (Why? I don’t want bored fans!) or for bringing beat up books to be signed. (Double why: do you know how great it is to see that you’ve read one of my books over and over?!) So relax! 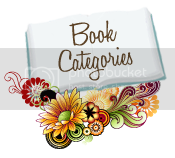 Bring your favorite book to be signed! Ask to take a picture! Be happy! Don’t try to sit in my lap or cut some of my hair as a souvenir, but by all means, SQUEE! And you’d think, being an author, spending a lot of time with other authors, I would myself be over the squeeing. Sadly, this is not the case. I am a Biblioholic. I love books with a passion that cannot be described in mere words. Which means that I also love the authors of these books, and no matter how many I meet, I don’t think this sense of wonder, this thrill, this anxiety, even, will ever leave me. I hope it doesn’t, because it makes life exciting. 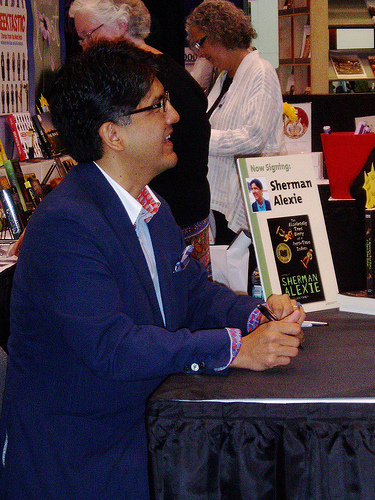 For instance, last year I met Sherman Alexie. That’s right: ABSOLUTELY TRUE HISTORY OF A PART-TIME INDIAN Sherman Alexie. “Giving Blood” Sherman Alexie. RESERVATION BLUES Sherman Alexie. And let me tell you, if you ever get a chance to hear this man speak, TAKE IT. Within five minutes, I was sobbing with laughter. Sobbing. With. Laughter. 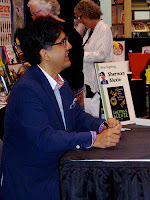 When it came time to get our books signed, I knew there was no way I could say, “Hey, I’m an author, too!” to this man. He’s won a National Book Award. He’s done amazing things in his life, he’s also suffered terribly, and yet come out as a warm, funny, brilliant person. I write about dragons that collect shoes. I didn’t feel the need to cloud the air, as it were, by comparing myself to him. I’m sure that he would have been polite, even genuinely interested, had I said something, but I simply couldn’t. My sister nudged me, but all I said was my first name, and complimented him on his hilarity and his fine body of work. My sister nudged me again, and muttered, “Sara Zarr,” a friend of mine who had been nominated for the National Book Award the same year and knew him, but I shook my head. One of the staff of the King’s English came over to bring him more water, and did this thing with her eyebrows like, “Should I introduce you?” I shook my head. What I wanted, more than any sort of recognition, was just to bask, as a fan of a great writer. This is not to say that I haven’t been bold. Oh, my, no! I have done things so brave that it still takes my breath away! Case in point: if you’ve ever spoken to me for longer than five minutes about books you know that I worship Guy Gavriel Kay. Worship him. (Guy, if you’re reading this: you are banned from commenting on that.) Guy and I correspond via email (as he insists on living in Canada, go figure), but our correspondence came about because I did the Bravest Thing Ever. In the fall of 2007 I went to the World Fantasy Convention in Saratoga Springs, New York. Guy was the toastmaster that year, which made me break out in a cold sweat just thinking about it. Imagine if I ran into him in the elevator! The mind boggled. After the opening reception, I sidled up to Guy with my beloved copy of LORD OF EMPERORS and asked him to sign it. I was literally shaking. Since I had read A SONG FOR ARBONNE in high school I had been in love with this man’s books. I didn’t dare tell him I was also a writer, just told him how much I loved his books, but particularly loved the ending of EMPERORS, which made me cry in a good way, and sometimes when no one is looking I still like to reread the epilogue and have a little cathartic sniffle. Then I sidled off, clutching my freshly signed book. That’s not the brave thing. Will it always be this way? Probably. I nearly fainted when I was on a panel with Charles de Lint, who remembered meeting me at a book signing two years before. Jane Yolen (JANE YOLEN!) was also on the panel, and kept calling me Janet, but I didn’t dare correct her because if Jane Yolen wants to call me Janet, by darn, she can call me Janet! But sometimes, just sometimes, that Moment of Squee turns to a Moment of Eep. Sad, but true! I shan’t name any names, but last year I met an author whose books I have loved since junior high, let’s call them Eeyore. Influential in my own writing, still a favorite, and I with starry eyes approached Eeyore to get two of my favorite books signed. Eeyore was polite, seemed like a good sort, I went away happy. But then, as a special treat, a mutual friend invited me to go to dinner with Eeyore. For two hours I was treated to a catalogue of how wronged poor Eeyore was by the publishing industry, and fickle fans, and the world at large. Everything sucked, everyone is against Eeyore, Eeyore wants to give it all up and go live in a cave. Eep. Some of my favorite books have apparently been written under contractual duress, and Eeyore hates them. In five years, Eeyore predicts that no one will be buying books at all, and authors will be obsolete. EEP! I went home so depressed that I felt like wilted lettuce. I was so bothered that THREE DAYS LATER I finally emailed Guy Kay to ask Why?! Why is Eeyore like this? Is Eeyore’s life really so terrible? Is Eeyore’s dire publishing prediction coming true? According to Guy: no. Apparently, Eeyore was like this twenty years ago when the little gray donkey was on the top of the bestseller list and the darling of the publishing industry. Eeyore has issues, but they shouldn’t get me down. Eeyore can continue eating thistles, in short, and I should go eat honey with Pooh and try to wash My Dinner with Eeyore from my brain. For a little while, I thought I would be unable to read any of Eeyore’s books, but the next one that came out was good enough that I was able to put the author’s attitude behind me and enjoy the book for it’s own sake. Whew. I’ve been very fortunate in that the majority of the authors that I have met have been lovely people. My sister and I have a Nice Authors Write Great Books theory: We swear that the most gracious people turn out to be the best authors. Perhaps our opinions of their books are colored by meeting them, but perhaps not. (See anecdotes above: I was already a fan of Guy, Garth, Charles, Jane, and Sherman before meeting them!) True story, I just spent an evening in a hotel room eating chocolate cake with Bree Despain, Holly Black and Emily Wing Smith, among others. Wonderful ladies all, fun at parties, and fabulous authors! So don’t be afraid to have your own Moment of Squee! If you get an opportunity to meet an author you admire, take it! Good things come to those who meet authors! Use the comments to tell us about your Moment of Squee! If you must relate a Moment of Eep, pick a fun pseudonym for the bad author, we don’t want to start any flame wars, please! My squee moment was meeting Elizabeth Scott and i think I was talking so fast she had no chance of understanding me, but maybe my enthusiasm came over because she hugged me :) I think if I ever met Melina Marchetta I wouldn't even be able to squee I just hold my book at her dumbly. When I met Shannon Hale, since she is one of the first really influential authors that I fell in love with, I was talking so fast and so much that I don't even remember what I said, I just couldn't stop talking and repeating myself. Luckily, she was very gracious and nice about it. :) I felt like such a goof, and I had the biggest foolish grin ever. So, you've already documented MY moments of Squee! as well :). But I have to say 1) I still hate the word, "Squee;" 2) I really, really still feel stunned that I met Guy - the writer of some of the best books in the universe - with you; 3) That going places with you has allowed me to meet some of these amazing authors and stand in awkward silence; 4) that I was an idiot meeting Poet Billy Collins, but a bigger idiot when I met Sherman with you - you were so gracious NOT to document that I stood about 5 feet away, grinning stupidly and making a "Gah" noise in my throat as he signed my book! ; 6) That I hold firm to my theory that good writers are awesome and gracious in real life - but I fear that being a Hemingway fan may negate that theory: too bad we can't test it/or maybe that's good! ; 7) And, finally, I second your advice: one of my biggest regrets was that I had overwhelming stage fright while waiting in line to have Neil Gaiman sign my books, after hearing him speak, and had to leave. That was stupid. But it was - sigh - Neil.... 8) One more: I know you and you're usually nice, but I don't know if I've squeed since Mom first brought you home from the hospital ;). 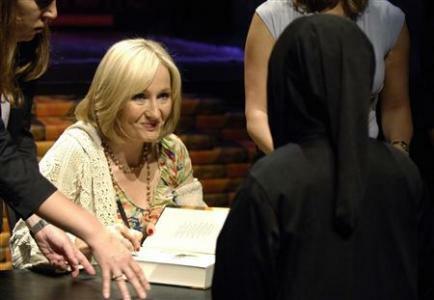 You got to meet J.K. Rowling? No fair! I have never had a moment of squee or eep, because, unfortunantly, there have never been author signing in my area by authors I like. However, if I went to one of your signings, that would definantly be a moment of squee. My big moment of squee involved you, Jessica! That author event at the Logan library back in April...imagine putting 5 of my very most favorite authors (Brandon Mull! Shannon Hale! 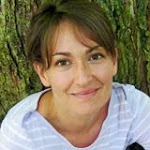 Ally Condie! Jessica Day George! James Dashner!) in the same room AND LETTING ME MEET THEM ALL. Oh wait...that happened! Yeah, that was a total squee-worthy day. I *still* find myself squeeing over that. 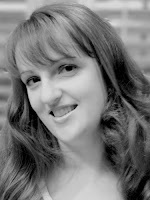 Like Jenn Z, the first author I met was Shannon Hale. She has always been a big inspiration to me, and I babbled like crazy at her while she signed the books I had brought. But she was so gracious and so kind. She also "wore" her baby on her belly in a front pack, and I wore mine, too, so I felt we were destined to be friends. :) She was so funny and so sweet--I'll never forget meeting her! Since meeting Shannon, I've had the pleasure of meeting lots more authors, and I've been impressed by how nice and sincere they've all been. I wish I could've attended the recent signing at the Logan library that Ems referred to! What a great group of authors! One more thing: I always email an author (if I can find his/her contact info online) when I love his/her book. I am continually amazed by how many of them reply! I loved ~Megan~'s story of getting a signed book and a hand-written letter in the mail. That is so fantastic! Thanks for this great post, Jessica! It was such a pleasure to meet YOU in person last week! I definitely "squee-ed" inside! Oooh. Moments of squee. I have to say that I have never actually squee'd, but the first author I ever met was Brandon Sandersen, and he was totally awesome and funny, and he signed my huge pile of books patiently. Another amazing moment was when I went to the author's night at the Logan Middle School. I met Jessica Day George and she was so nice, even though I was babbling like crazy. And it was almost midnight when Brandon Mull got around to me, and he still took the time to ask my name and which book was my favorite, and I was so excited to meet him that I couldn't think straight. Meeting those authors was so much fun. Thanks, guys! I met Lois Lowry this past January, and that was definitely a dream come true! And Mo Willems as well (one of my all-time favorite picture book writers). It was awesome. If I could meet any authors of the past, my easy picks would be Jane Austen and Charlotte Bronte. To say that I am obsessed with their novels would be quite an understatement. My squee moments: Meeting you and Shannon hale at conferences and recently meeting American Idol Brook White (almost running into her, literally—twice) and getting a big hug from her. I don't often get out to meet authors. 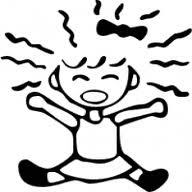 But I totally squee whenever I get a retweet or a reply from one. My squee moments are few, but will live on in my memory (and those signed books on my shelf) forever. My first squee moment was meeting Gordon Korman. I stood in line for forty-five minutes listening to some picture-book artist ramble on and on, and upon reaching his table I handed over my book, he smiled at me and complimented me on my name, and I grinned so wide my face was practically stuck and squeeled something semi-incomprehensible (and probably incredibly stupid) by way of thanks. My second squee moment was meeting both you and Shannon Hale, where I was standing up there almost afraid to breath for fear of doing something stupid, as you both signed copies of my books. I worked up my courage and told you I had read all your books but one, and that I was going to buy Sun and Moon, Ice and Snow, but that it was already sold out. (I have since read it and absolutely adored it, by the way). You smiled at me, I got my books back, and stumbled off the platform, only for you to call my name (she called my name! Jessica! Day! George! Knows my name! Oh, right, she just signed a bunch of books to me . . . ) and me to turn around dazedly, and be handed an extra bookmark for my brother. I wandered around in a daze for the rest of the day, periodically opening my copies of Princess Academy, Dragon Slippers, and Tuesdays in the Castle, hardly daring to believe that I truly held in my hands something that you and Shannon Hale (respectively) had touched. I've met Gail Carson Levine several times, first at a book signing. THEN I got to go to her SUMMER WRITING CLASS, once a week for six weeks, never ending internal squee. 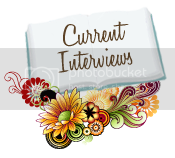 "I want to win a book"
I have been to a couple of book signings for Richelle Mead and one for Maggie Stiefvater. But I think my ultimate moment of squee happened when I went to the Hunger Games tour and saw Jennifer Lawrence, Josh Hutcherson, and Liam Hemsworth. I'm jealous of Agnes; I worship at the feet of Gail Carson Levine! I haven't had many moments of squee myself. I did attend a poetry reading by Ted Kooser, my favorite poet. I was first in line to get my book signed, and I wanted to say so many glorious things about how I love his use of language and how he makes the everyday into something beautiful. But I clammed up, handed him my book, then rushed off like a shy toddler.